We are Colorado’s largest IN STOCK Surly bike shop dealer, Cinelli dealer, Retrospec, Masi, Tribe, Haro Dealer....We have electric bicycles too. We try to stock most models year round. We specialize in commuter bikes, road bikes, mountain bikes, cyclocross bikes, single speed bikes, fixed gear bikes, track bikes and fat bikes - e-bikes and snow bikes. ​ We build eBike 12 gauge spoke wheels. We have 700c road and 26" and 29er mountain bicycle wheelsets too. We have a professional FULL SERVICE, service department and can literally fix any issue you have. And our pricing should be the best in town. We do some cool bike stuff. 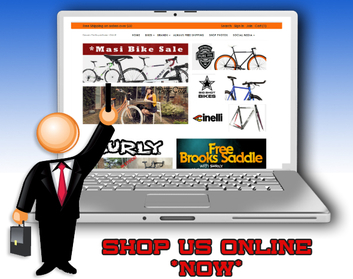 Buy, Sell or Consign Your Bicycle! We would love to buy or consign your older or newer bicycle. We have been buying bicycle's for six years here in Colorado and we know used bicycle! We will always pay a fair price! If your looking to buy a bicycle we always have fully tuned and ready to ride bicycles for fair prices too. We've been selling these spinning bicycle here in Denver for over 13 years. They are a great addition to your workout without having to spend $1400 just to break a sweat! Free Delivery in the Metro Area. Some assembly required but for the most part they are 90% assembled in the box. We will set up and deliver the spin bike for $50.